There is something very unique about the All Worn Out Jug Band. In addition to being part of the “Post-Modern” Jug Band Movement, this group performs eclectic sets that include Jug Band classics interwoven with American roots music from traditional folk to Cajun, country and gospel. 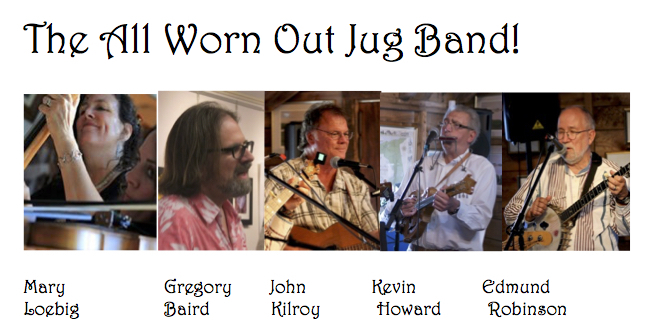 As with many accomplished Jug Bands, you can expect to hear a washtub or doghouse bass, washboard, kazoos, whistles, and of course, a jug — a full complement of strings including guitar, mandolin, ukulele, fiddle, banjo, and Dobro, and an occasional concertina. Formed originally to raise funds for Chatham’s Unitarian/Universalist Meeting House, The Band has been performing on Cape Cod for twelve years playing festivals and gigs from Falmouth to Provincetown to Nantucket. Their 2008 CD’s songs have been played on WUMB, they’ve played live on WOMR, and, true to their Chatham roots, they have been a staple of that town’s 4th of July and First Night festivities for the last 12 years. The current lineup includes Gregory Baird, Kevin Howard, John Kilroy, Mary Loebig, and Edmund Robinson — they bring a decidedly animated stage presence to performances that can have audiences dancing in the aisles by the encore.